Mariana of Austria or Maria Anna (24 December 1634 – 16 May 1696) was Queen of Spain from 1649 until her husband Philip IV died in 1665. She was appointed regent for their three-year-old son Charles II and due to his ill health remained an influential figure until her own death in 1696. Maria Anna was born on 24 December 1634 in Wiener Neustadt, the second child of Ferdinand of Hungary and Maria Anna of Spain. In 1637, her father became Emperor Ferdinand III on the death of Emperor Ferdinand II. Her parents had six children, of whom three survived into adulthood. Maria Anna's elder brother, Ferdinand IV of Hungary died in 1654 at the age of 21; her younger brother Leopold succeeded as Emperor in 1658. The marriage was not a happy one; Mariana was excluded from government, focusing instead on religion and exceptional piety. Only two of their five children lived into adulthood; the eldest, Margaret Theresa (1651-1673) followed her mother's example in 1666 by marrying her maternal uncle Leopold I, Holy Roman Emperor. Mariana's second daughter, Maria Ambrosia, lived only fifteen days, followed by two sons, Philip Prospero (1657-1661) and Ferdinand Thomas (1658-1659). Shortly after Philip Prospero's death, on 6 November 1661 Mariana gave birth to her last child, Charles. Unlike his elder sister, he suffered a number of physical disabilities and was known as El Hechizado or "The Bewitched" from the popular belief his ailments were caused by "sorcery." In Charles' case, the so-called Habsburg lip was so pronounced he spoke and ate with difficulty all his life. He did not learn to walk until he was eight and never attended school but foreign observers noted his mental capacities remained intact. It has been suggested Charles suffered from the endocrine disease acromegaly and a combination of rare genetic disorders often transmitted through recessive genes, including combined pituitary hormone deficiency and distal renal tubular acidosis. However, this is speculation; the authors of the most significant study state that 'it has not been demonstrated the disabilities suffered by Charles II were caused by the expression of detrimental recessive alleles inherited from common ancestors. 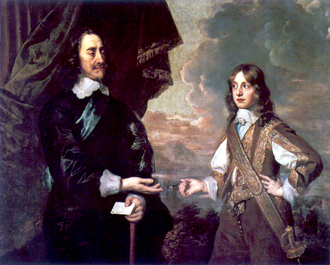 As Charles was only 3 years old when Philip died on 17 September 1665, Mariana was appointed his regent, advised by a Regency Council, until he became a legal adult at the age of 14. Her competence is difficult to assess; even modern opinions often reflect contemporary views on the role of women and Mariana as a 'foreigner,' while the second half of the 17th century was one of almost continuous crisis for Europe in general, not only Spain. Recent studies argue she attempted significant reforms but these were compromised by internal political feuds. The struggle between 'Austrian' and 'French' factions, respectively led by Mariana and Charles' illegitimate half-brother John of Austria the Younger, was worsened by Spain's division into the Crowns of Castile and Aragon. Each had very different political cultures and traditions, making it hard to enact reforms or collect taxes; government finances were in perpetual crisis and Spain declared bankruptcy nine times between 1557 and 1666, including 1647, 1652, 1661 and 1666. Mariana followed the system established by Philip of governing through personal advisors or "validos," the first of whom was Juan Everardo Nithard, an Austrian Jesuit and her personal confessor. Since Philip's will excluded foreigners from the Regency Council, Nithard first had to be naturalised, which caused immediate resentment. The new government was faced with the long-running Portuguese Restoration War and the War of Devolution with France; Spain declared bankruptcy in 1662 and 1666, making reductions in military spending a matter of extreme urgency. In 1668, the Treaty of Aix-la-Chapelle ended the war with France while the Treaty of Lisbon accepted the restoration of the Crown of Portugal and loss of the Portuguese Empire. These concessions were an acceptance of reality and in many ways Aix-La-Chapelle was a diplomatic triumph, since France returned most of its gains but many nobles saw it as a humiliation. John instigated a revolt in Aragon and Catalonia, forcing Marianna to dismiss Nithard in February 1669 and replace him with Fernando de Valenzuela. When Charles came of age in 1675, John used the opportunity to dismiss Valenzuela but he was restored in 1677 when the Regency was reinstated due to Charles's ill-health. The Franco-Dutch War in 1672 dragged Spain into another expensive war with France and John finally gained control of government in 1678. He died in September 1679, one of his last acts being to arrange a marriage between Charles and 17-year-old Marie Louise of Orléans in November 1679. Mariana was once more restored as regent, although her influence over Charles was diminished by his new wife. The 1683-84 War of the Reunions was followed in 1688 by the outbreak of the Nine Years' War. In February 1689, Marie Louise died; as with many deaths of the period, there were allegations she was poisoned but modern assessments of her symptoms conclude the cause was almost certainly appendicitis. 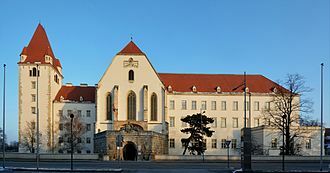 To replace her, Mariana selected Maria Anna of Neuburg, one of 12 children, whose eldest sister Eleonore was the third wife of Emperor Leopold, making her aunt to future emperors Joseph I and Charles VI. From Marianna's perspective, these Austrian connections and the family's record of fertility made her an ideal choice. However, Charles' second marriage was also childless; by that time, he was almost certainly impotent, his autopsy later revealing he had only one atrophied testicle. 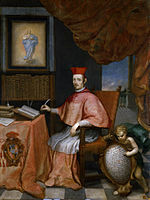 As his health declined, internal struggles over the succession became increasingly bitter, with the leadership of the pro-French faction passing to Fernández de Portocarrero, Cardinal and Archbishop of Toledo. Under the influence of the 'Austrians,' in 1690 Spain joined the Grand Alliance coalition against France, which proved a disastrous decision. The state declared bankruptcy once again in 1692 and by 1696, France occupied most of Catalonia; Mariana retained power with the support of German auxiliaries under Maria Anna's brother Charles Philip, many of whom were expelled after Mariana's death. 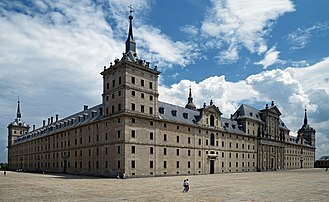 She died on 16 May 1696 at the Uceda Palace in Madrid, at the age of sixty-one; the cause is thought to have been breast cancer. 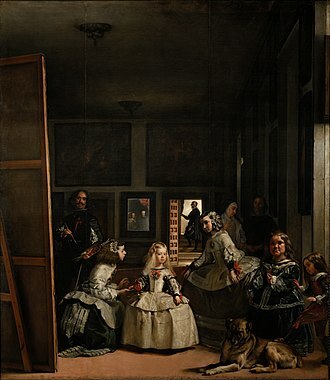 Her daughter Margaret Theresa in Velázquez's masterpiece Las Meninas. Las Meninas detail; Mariana and Philip appear reflected in a mirror. Mariana supported the 1668 mission led by Diego Luis de San Vitores and Saint Pedro Calungsod to convert the indigenous Chamorro people of Guam and the Mariana Islands to Christianity. The Portrait of Mariana painted by Diego Velázquez was commissioned by Philip and is the only known full-length painting of her. The original is in the Prado Museum in Madrid; a copy was sent to her father Ferdinand and is held by the Kunsthistorisches Museum in Vienna. 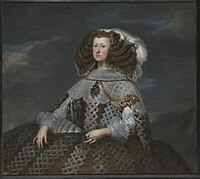 Several other portraits of her were made, including Juan Bautista Martínez del Mazo's Queen Mariana of Spain in Mourning, 1666. She also appears as a detail in Velasquez' masterpiece Las Meninas which features her daughter Margaret Theresa. ^ Graziano, Frank (2004). Wounds of Love: The Mystical Marriage of Saint Rose of Lima. OUP. pp. 106–107. ISBN 0195136403. ^ Mitchell, Sylvia Z (2013). Mariana of Austria and Imperial Spain: Court, Dynastic, and International Politics in Seventeenth- Century Europe. University of Miami Scholarly Repository. pp. 19–21. Retrieved 4 September 2018. ^ Storrs, Christopher (2006). 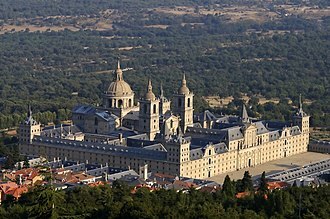 The Resilience of the Spanish Monarchy 1665-1700. OUP Oxford. p. 154. ISBN 0199246378. ^ Barton, Simon (2009). A History of Spain. Palgrave. ISBN 0230200125. ^ Storrs, Christopher (2006). The Resilience of the Spanish Monarchy 1665-1700. OUP Oxford. p. 158. ISBN 0199246378. ^ a b c Wurzbach, Constantin, von, ed. (1861). "Habsburg, Maria Anna (Königin von Spanien)" . Biographisches Lexikon des Kaiserthums Oesterreich [Biographical Encyclopedia of the Austrian Empire] (in German). 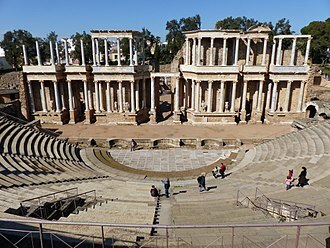 7. p. 24 – via Wikisource. ^ a b c Wurzbach, Constantin, von, ed. (1861). "Habsburg, Maria Anna von Spanien" . Biographisches Lexikon des Kaiserthums Oesterreich [Biographical Encyclopedia of the Austrian Empire] (in German). 7. p. 23 – via Wikisource. ^ a b Cartwright, Julia Mary (1913). Christina of Denmark, Duchess of Milan and Lorraine, 1522-1590. New York: E. P. Dutton. pp. 536–539. Fernando de Valenzuela, 1st Marquis of Villasierra, Grandee of Spain, was a Spanish royal favourite and minister. Francisco having died young, his son was placed by his mother as a page in the household of the Duke of Infantado and he lost his place owing to a reduction of the Dukes establishment, and for several years he lived obscurely. 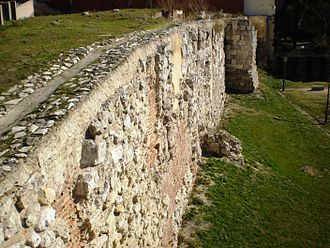 By good fortune he succeeded in persuading Maria de Uceda, one of the ladies-in-waiting to Queen Mariana of Austria, second wife of Philip IV, with the help of his wife, Valenzuela obtained a footing in the palace. He was appointed introducer of ambassadors on 12 October 1671, and he became popularly known as the duende, the fairy or brownie of the palace, and was believed to be the lover of the queen. He was considered as successor of the previous valido, Juan Everardo Nithard, Valenzuela succeeded in getting the embassy exchanged for the governorship of Granada. His stay at this post was short, for he was able to organize a counter-intrigue which soon brought him back to court. Portrait of Marie Louise wearing a fleur-de-lis dress to signify her relations to France and a Spanish crown to signify her new country. Marie Louise, Charles and his mother, Mariana of Austria, attend together an auto de fe from a balcony in Madrid's Plaza Mayor on 30 June 1680. Detail from Auto de fe (1683), painting by Francisco Rizi. Prado Museum, Madrid. 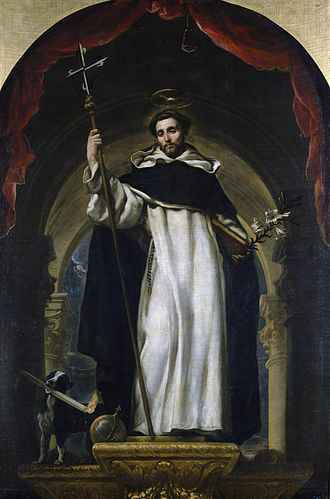 Fernando de Valenzuela, portrait by Claudio Coello, c. 1660. Don Fernando de Valenzuela, Marquis of Villasierra, portrait by Juan Carreño de Miranda, c. 1675.